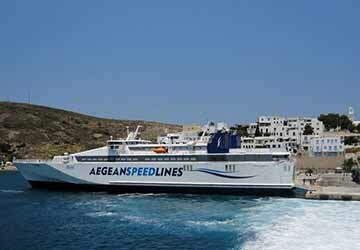 Aegean Speed Lines offers ferry services between the port of Piraeus(Athens) and the islands of Cyclades. Aegean Speed Lines uses three ultra-modern high-speed ferries to operate its routes - Speedrunner II, III, IV, all carrying up to 170 cars and 800 passengers. All of Aegean Speed Lines ferries meet leading comfort, quality and safety requirements ensuring great value for money on your trip. With directferries.com you can find Aegean Speed Lines timetables and Aegean Speed Lines ferry tickets online. Direct Ferries provides a ferry timetable and price comparison, based on your search criteria, allowing you to compare Aegean Speed Lines products with multiple ferry company timetables and fares in one search. Compare Aegean Speed Lines timetables and prices now with all alternative ferry operators before booking your ferry ticket to ensure you get the best option for your ferry trip. BOOKING WAS OK - WITH A PRINTED COPY OF THE CONFIRMATION, WE GOT THE TICKETS. THE CROSSING WAS PERFECT. Ship on time, clean, reasonable prices at the coffee shop. Everything went well. Travel times contents. Clean toilets. No complains, but the price is high! Worthy value service.